25 | October | 2014 | Whats Happening? Kabobs on Fourth, a new Mediterranean restaurant located at 214 West Fourth Street in downtown Winston-Salem, will open in late October or early November according to owner, Nazanin Kaussari . The restaurant is located at 214 West Fourth Street. Kabobs on Fourth will seat 70 diners and will feature counter service, sidewalk dining and an on-site bakery in the front window. The menu features grilled beef, chicken, lamb, vegetables, ground beef and fish served with rice and salad with a typical price range of $8 to $12. The menu also includes a variety of Vegetarian dishes that are new to Winston Salem’s diners’ taste. Beer and wine are also available for purchase. Kabobs on Fourth will operate during the following business hours: Lunch Daily (Monday – Saturday) 11 a.m. – 3 p.m. Sunday Brunch 11 a.m. – 3 p.m. Dinner (Monday -Thursday) 5 p.m. – 8:30 p.m. Dinner (Friday and Saturday) 5 p.m. – 10:30 p.m.
Xia Asian Bistro open in Liberty Plaza Building – Xia Asian Bistro is open in downtown Winston-Salem at Liberty and Third Street. Xia Lieu, who has 24 years in the restaurant industry, used to be located on Spruce Street where Wen Hwa is currently. Contemporary chic ambiance with big city, they have 4,000 square feet with cosmopolitan decor with plenty of seating and a large bar, expanded menu and sushi bar. Lunch is every day from 11 a.m.- 3 p.m. Dinner Sunday -Thursday 5 p.m. Friday-Saturday 5 p.m. – 11 p.m. Parking available in the Liberty Plaza Deck. For more information visit http://xiarestaurant.com or call 293-7925. 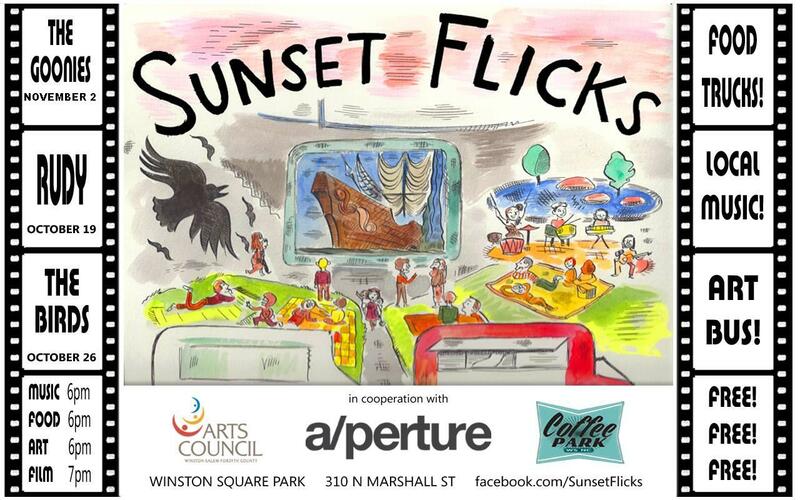 Sunset Flicks continues Sunset Flicks is a collaboration between a/perture, the Arts Council & Coffee Park at Winston Square Park premieres on Sundays in October continuing until the 26th. Films, food, music and art fill the lineup. October features WSNC’s own B.Kin Band, Camel City Grill. October 26th they will thrill you with Hitchcock’s The Birds.S2dio Supplies will provide some artsy fun for all each Sunday. Food and music start at 6 p.m. The screenings start at 7p.m. All of this is happening at Winston Square Park on Marshall Street in downtown Winston Salem. And, oh yeah-it’s a FREE event thanks to the Arts Council!